Venture out of the city with trips to Fayetteville (Room Escape Games, Dickson Street Bookshop, & more), Heather Hill Farms (in Ozark) and National Tiger Sanctuary (in Saddlebrooke). There's lots more to do: take an in-depth tour of Ancient Ozarks Natural History Museum, steep yourself in history at Sequoyah's Cabin, explore the activities along Lake Atalanta, and admire the natural beauty at Compton Gardens and Conference Center. To see traveler tips, maps, reviews, and more tourist information, read our Bentonville journey planner. Joplin to Bentonville is an approximately 1.5-hour car ride. October in Bentonville sees daily highs of 72°F and lows of 51°F at night. Finish your sightseeing early on the 27th (Sat) so you can travel to Kochi (Cochin). Change things up with these side-trips from Kochi (Cochin): Marari Beach (in Mararikulam) and Andhakaranazhi Beach (in Alappuzha). 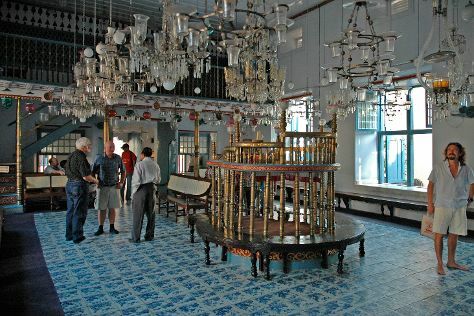 And it doesn't end there: have some family-friendly fun at Plug And Play Gaming Lounge, pause for some serene contemplation at Vallarpadam Church, contemplate in the serene atmosphere at Paradesi Synagogue, and don't miss a visit to Chinese Fishing Nets. For reviews, photos, ratings, and more tourist information, read our Kochi (Cochin) day trip planning tool . Explore your travel options from Bentonville to Kochi (Cochin) with the Route module. You'll lose 11 hours traveling from Bentonville to Kochi (Cochin) due to the time zone difference. Traveling from Bentonville in October, you will find days in Kochi (Cochin) are somewhat warmer (88°F), and nights are much hotter (75°F). Cap off your sightseeing on the 5th (Mon) early enough to travel to Dubai. Get out of town with these interesting Dubai side-trips: Abu Dhabi (Ferrari World Abu Dhabi, Sheikh Zayed Mosque, & more) and Al Ain (Al Jahili Fort & Al Ain Oasis). Plan for a day of cool, family-friendly fun on the 12th (Mon) at Aquaventure Waterpark. Spend the 15th (Thu) exploring nature at Dubai Desert Conservation Reserve. There's lots more to do: enjoy breathtaking views from Burj Khalifa, tee off at Dubai Creek Golf & Yacht Club, take in the waterfront at Dubai Creek, and buy something for everyone on your list at The Dubai Mall. To see other places to visit, reviews, photos, and more tourist information, you can read our Dubai trip planning site . You can fly from Kochi (Cochin) to Dubai in 5 hours. Alternatively, you can do a combination of flight and bus; or drive. The time zone changes from India Standard Time to Gulf Standard Time, which is usually a -1 hour difference. In November, daily temperatures in Dubai can reach 87°F, while at night they dip to 73°F. Finish up your sightseeing early on the 16th (Fri) so you can travel back home.